A motto that I've used many times when people ask me what I do for a living is 'have camera, will travel!'. This video project that I worked on for the RSL Art Union is a great example of that. Several days spent at 3 wonderful locations doing what I love to do - shooting video! The RSL Art Union Draw 350 gives you the chance to win an apartment in Sydney (NSW), Melbourne (VIC) and Noosa (QLD). It was my job (and pleasure) to film each apartment and gather footage of the locations to produce a series of videos to be used for marketing purposes on the web and television including this morning segment on Sunrise (Channel 7). Lumix 7-14mm f4, Lumix 35-100mm f2.8, Olympus 12-40mm f2.8, Lumix 42.5 f1.7. I really enjoyed shooting the footage for this video, not only because I love the locations but also because I had some new equipment, namely the Zhiyun Crane and the Edelkrone SliderOne that I was very keen to use in the field. Both pieces of equipment are small and ideal to travel with while also producing quality video results. The Zhiyun Crane was a substitute for my DJI Ronin-M and the SliderOne was a substitute for my Syrp 3 axis motion control system with its 1000mm slider. Port Melbourne, Phantom 4 Pro | © David Dwyer 2017. My GH5 on the Edelkrone SliderOne with motion control. As a registered drone pilot, I was very excited about getting some aerial footage at these locations. At this point I would like to recommend a smartphone app that all drone operators should use - 'Can I Fly There?'. This app is a must for anyone flying drones as it clearly maps all restricted airspace and allows one to clearly know where you can legally fly. Not surprisingly, there wasn't many areas around the Sydney CBD but I was extremely happy with the footage I was able to get at Port Melbourne. 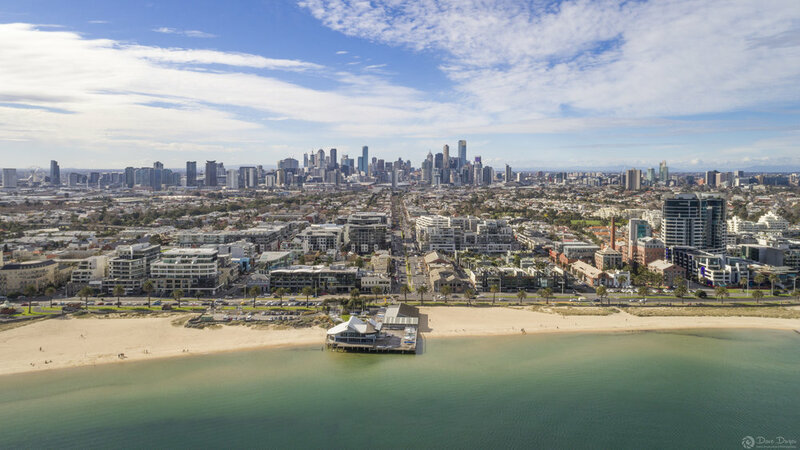 The perspective looking back from Port Melbourne Beach along Bay St towards Melbourne CBD is just awesome! I used the Edelkrone SliderOne with motion control module for the majority of my shots. The Zhiyun Crane was handy for location shots at Noosa - walking along the beach for example, but the Sliderone was a joy to use. Nice smooth slider shots which weren't as restricted as you might think with only a 6" travel distance. Matching the smooth automatic slides with focus transitions on the GH5 equals quality results for sure - particularly when using the lovely little Lumix 42.5mm f1.7 lens. I spent two days in Melbourne and two days in Sydney. The first day was a travel day (from Brisbane) and then filming the apartment upon arrival. Day two was all about location shots - so lots of driving around to various landmarks and trying to find parking, which wasn't a lot of fun in Sydney CBD! Now that is a million dollar view! Yours truly on the balcony of the prize apartment in Sydney. It was blowing a gale at the Sydney Opera House and the sun was behind this iconic building when I arrived early in the morning so I wasn't able to get the shots I had hoped for - but I love the shot I captured along the boardwalk overlooking the Sydney Harbour Bridge. This was a great project and one that I'm really proud of. Super happy with the results and great to know my work is now being broadcast online and on TV. Draw 350 closes November 7th 2017 - depending on when you are reading this, you may still be able to purchase tickets here. Good luck! Newer Post2 GEMS MEDIA - A brand new video production company for Brisbane.